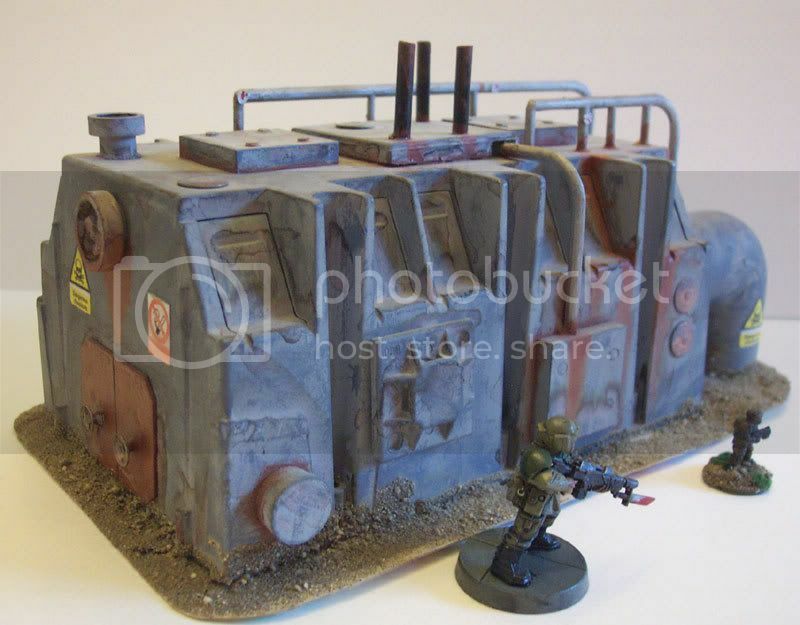 Just to share, here's a few different painting projects that have the rarity value of having actually been completed. Here is an Old Crow Models Trojan APC, with some greeblies added from the IG tank accessory sprue. The antenna is piano wire -- strong but flexible. I had hoped to paint it up in a Berlin Brigade camo pattern, but it didn't quite make it. Still a nice model, though. This is a DLD Productions Komodo APC. DLD is no longer doing business on the web, unfortunately. 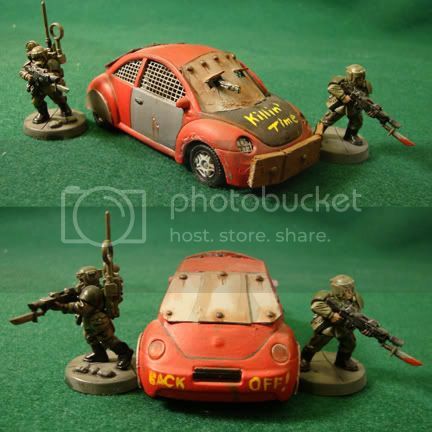 Here is a diecast VW bug that I kitbashed for some games of Combat Zone, a post-apocalyptic skirmish game. 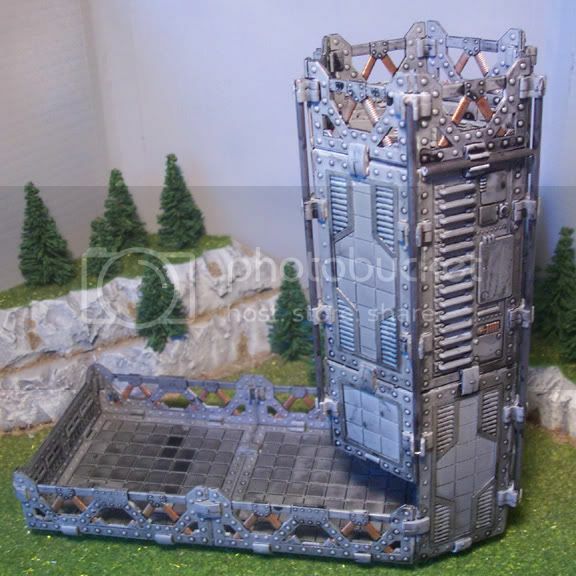 And here are some scratchbuilt orbital weapons platforms. 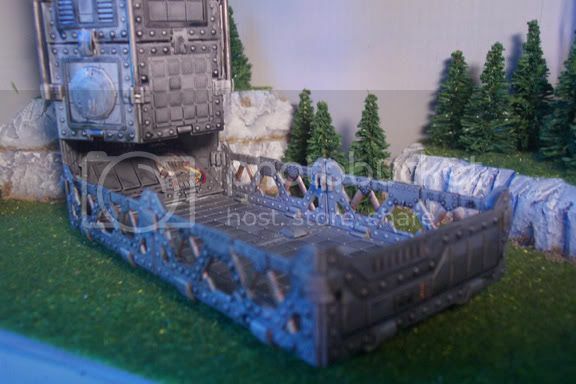 And this one is an asteroid/ore hauler. It is essentially welded to an asteroid in order to bring it back to a fusion-powered orbital centrifuge. That's enough for now. I'll take more pics later and post them up. Awesome looking stuff man. Keep posting, I would like to see more for sure. 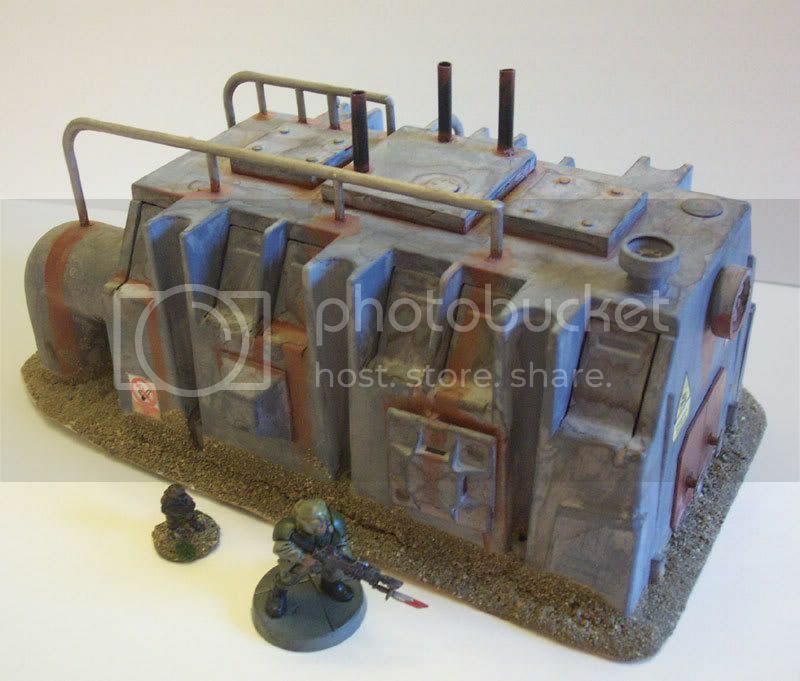 Do you paint FOW models (1/100 or 15mm) and if so, what are your rates? "What has war solved other than Fascism, Global Communism and oil shortages?" No, sorry! 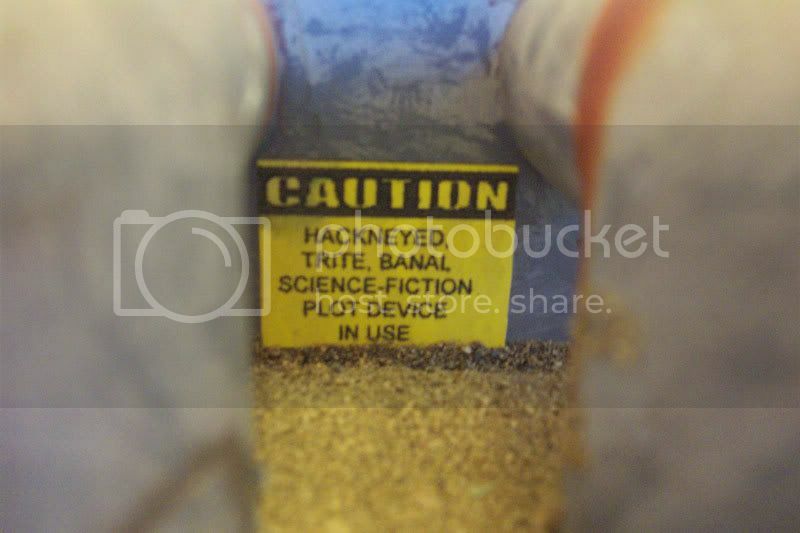 I only do sci-fi stuff. I'm not the droid you're looking for! 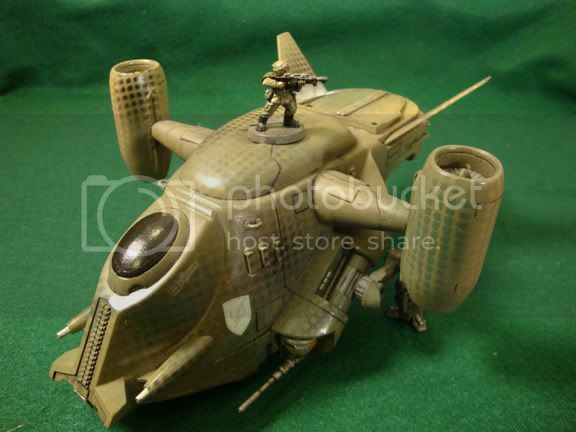 Speaking of which, here is a dropship that I kitbashed from a Star Wars Trade Fed tank and an A-10 model. 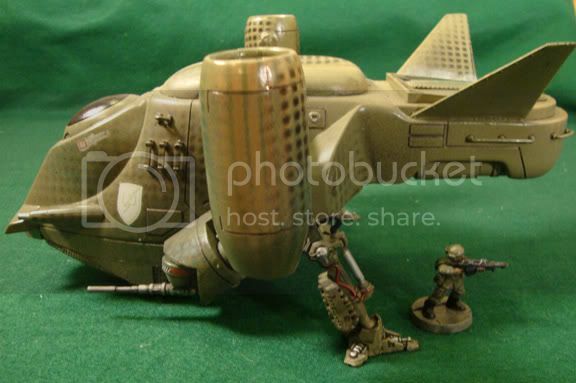 It works equally well as an infantry dropship in 28mm or a vehicle lander in 15mm. 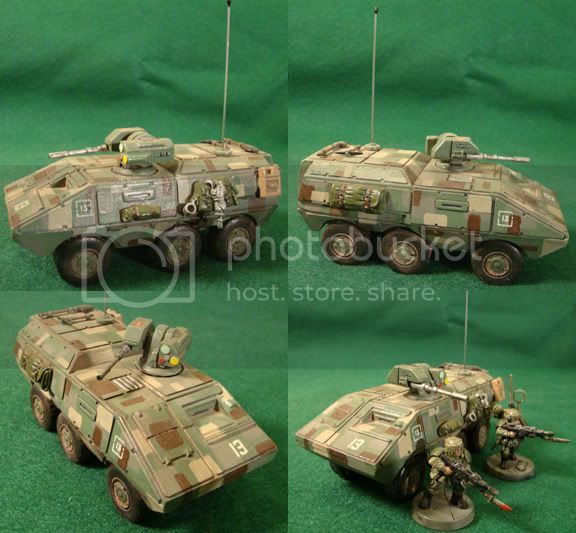 The figs in the pic are a GW Cadian for the 28mm, and a GZG New Israeli trooper and DLD Komodo APC for the 15mm. Love the dropper, the paint effects are neat too. 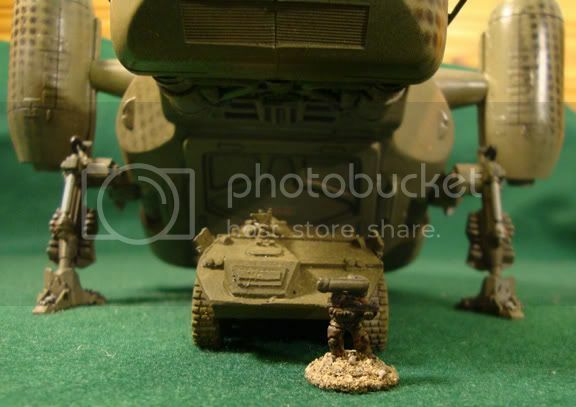 Have you ever played Battletech at all? Oh, yeah! I bought the original set when it first came to town, circa 1987. Great game! Awesome. My wife and I run games from time to time and I do some painting. Keep an eye on the BT/MW boards for the next game. 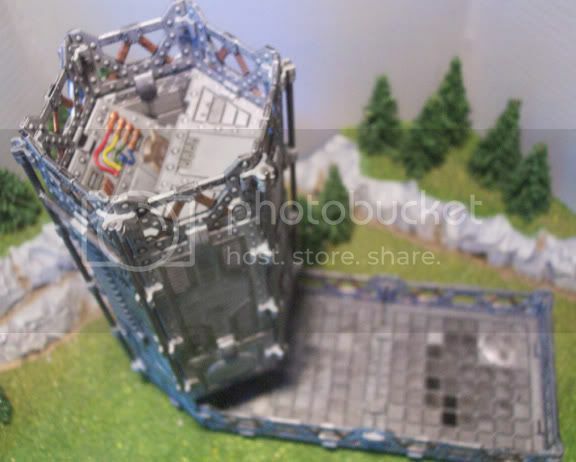 The electrical aisle at Lowes or Home Depot can be a treasure trove of terrain fodder. This is a 4-gong plastic junction box, with greeblies glued all over it and painted to a crappy standard. I was still trying to learn how to make rust streaks at the time. Best part about these is that they run from 25 cents to $6, so you could cover a whole board for not very much out of pocket. 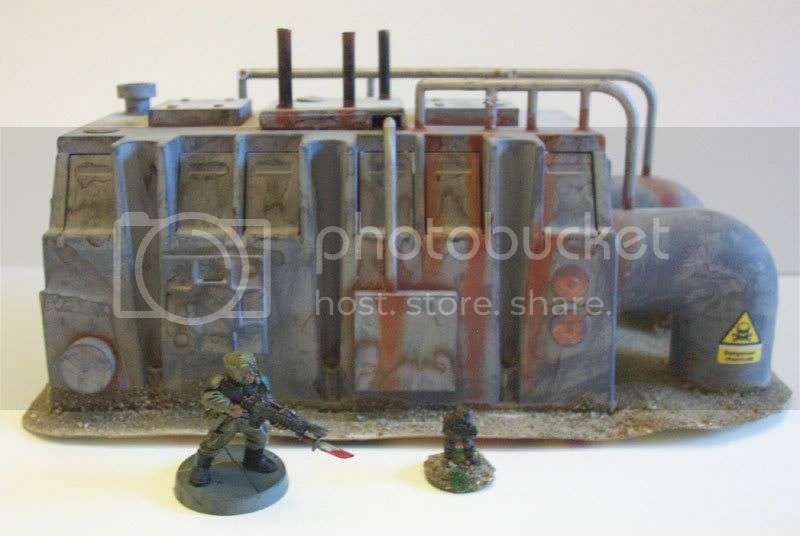 These things work equally well for 15mm and 28mm, so I've posed one of each kind of fig next to it for comparison sake. Sadly, the cardstock base has warped, so I'll have to replace it at some point. Ooh, this ones nice. I like the kinda "dusty" colors. ^^ Theyre all really nice. Neat Idea with the electrical boxes. 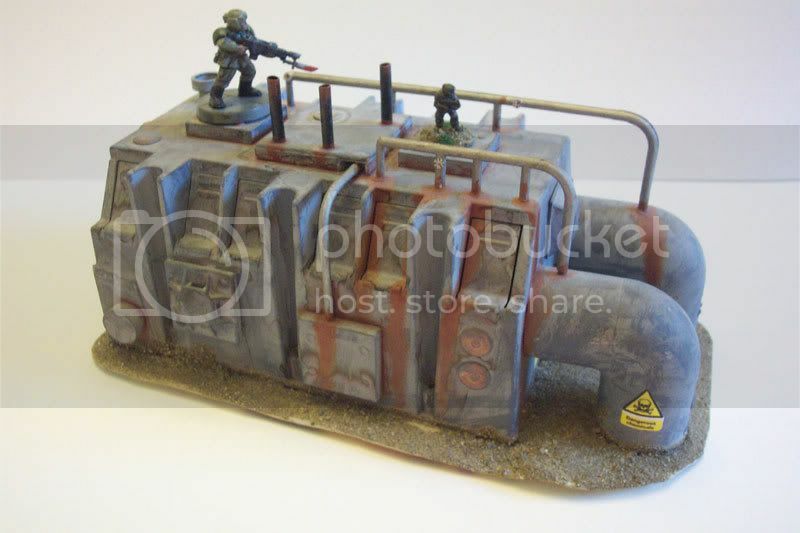 And the rust is a good start, maybe a deep reddish\brown wash dribbles over the spots to give a bit of depth? 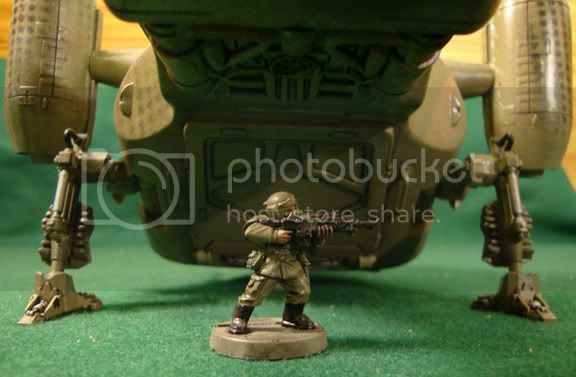 Hey, Javelin, do you ever visit Theminiaturespage.com (TMP)? A lot of the stuff you do would really be appreciated by the people over there. You'll also find a lot of ideas there that are right up your alley. Also, I've been meaning to get into Combat Zone, how much do you like it? Any interest in Full Thrust? Those ships you have painted up would be perfect for it! Great job on those, BTW. The more I look at them the more I want to order a Fleet Pack of ScanFed and Sa'Vasku ships from Ground Zero Games! Heck, yeah! Believe it or not, I'm known over there as -- brace yourself -- "javelin98". I've been on TMP since 2003 or so. Great place! I like Combat Zone quite a lot. It's easy enough to learn in an afternoon and there's lots of online support for it in the form of the Combat Zone Chronicles. Sadly, I've been getting out of 28mm because of space in my hobby room. 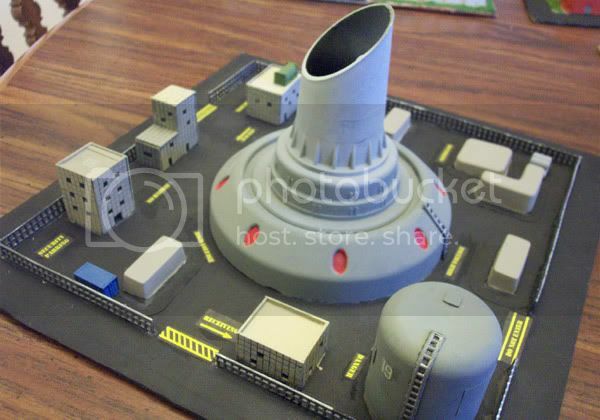 I'm mostly going to 15mm for my skirmish games (using Stargrunt from GZG), 6mm for big battles, and starship games. 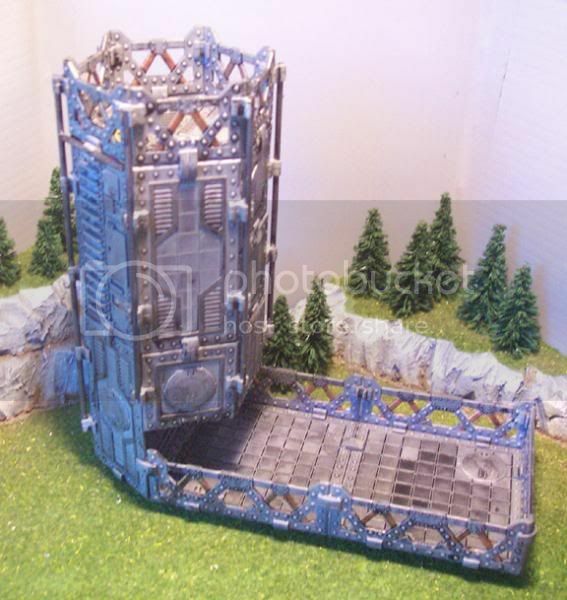 The only 28mm I'm planning on holding onto is my Space Hulk stuff. If you want to borrow the CZ core rule book, let me know and I can lend it to you. I might be putting it up for sale on TMP soon anyway. I actually have the full set of Full Thrust books on my shelf (FT, More Thrust, and Fleet Book 1 & 2), but I've never played it. I hear it's a great game, and I'm planning on trying it eventually. Currently I get my starship fix from Starmada, which is a great set of rules. 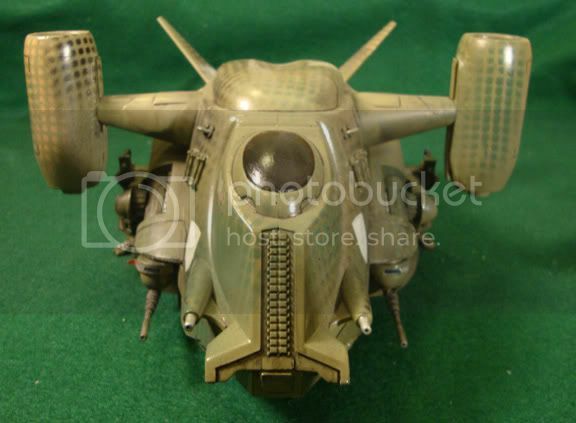 I currently have three fleets on hand, having just sold a UNSC fleet: an old-style Neu Swabian fleet, a fleet of ONESS Germans from Brigade Models, and a fleet of Talliscan ships from Kallistra UK. I'll post some pics of those here eventually. 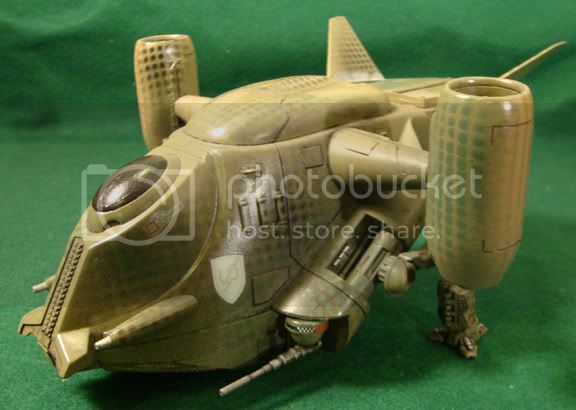 I actually ordered my first Starships from Em4. I bought three boxes of their starship minis. Their actually meant for fighter scale games like Silent Death but I chopped off the more fighter looking bits and managed to make three large fleets! All for around $12 or so! I also recommend Em4 for any sort of base. You can literal get bags of flight stands, 25mm round bases, square bases, hex bases, etc. All for a couple of US dollars. If you want to meet up sometime and talk hobby, I'm very fluent in geek ;). I could teach you Full Thrust and in exchange you introduce me to Starmada? I've heard it's a great game. 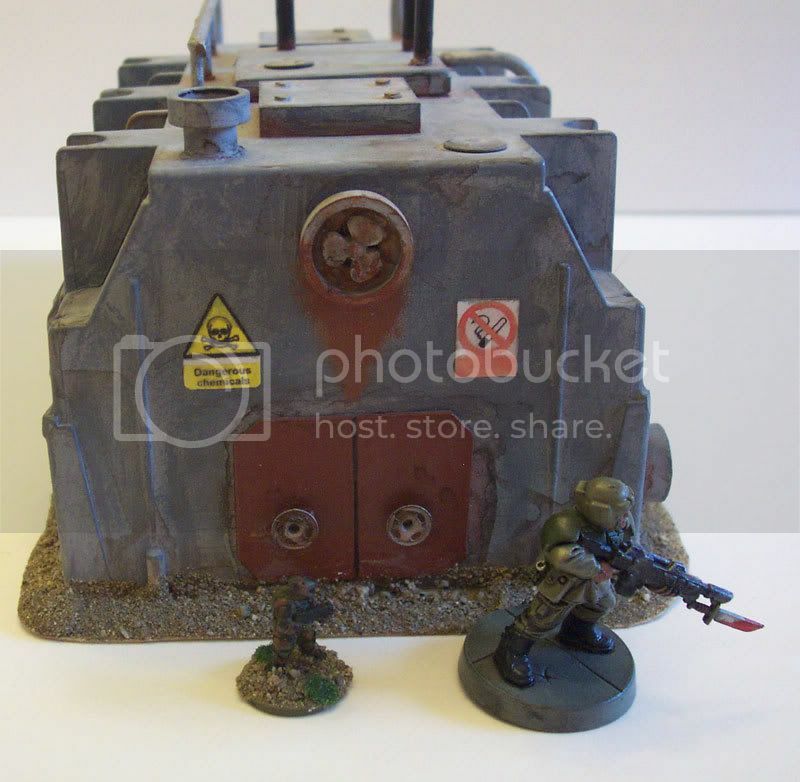 For larger scale battles (as well as For Mekton) I was planning on converting my Mechwarrior Clix because their so dirt cheap right now and I'm always looking for the cheapest way to get gaming stuff! I'd love to check out the rulebook but I live way north of Spokane and don't make it into town that often. I live near the little town of Valley, not The Valley, but iddy-bitty blink-and-you-miss-it Valley that's near Chewelah. I was planning on just buying the starter set on their website. You pretty much just buy the minis and the counters and rules come with. Plenty of Gangers and Troopers. On a side note, I'm into all sorts of other little games. One I've been prepping for is Giant Monster Rampage. I'm sculpting a few of my own beasties and building papercraft skyscrapers for little Godzilla-esque fights!